Portraiture was the most popular genre in sixteenth-century England, and indeed one of the few available to artists following the schism between the Church of Rome and the Church of England, of which Henry VIII became head. This likeness of the famous Tudor king is a magnificent example of Holbein’s remarkable style, characterised by a monumental rendering of figures which are nonetheless endowed with considerable psychological depth. In this markedly linear portrait, Holbein uses the frontal pose of the regal model and the position of his hands to convey the sitter’s powerful personality and majestic bearing. During the 16th century portraiture was the leading genre in England and almost the only one to which artists could devote themselves following the events of the early 1530s, the consequences of which were to drastically reduce their pictorial repertoire. Acknowledged as the supreme head of the Church, in 1534 Henry VIII was invested by Parliament as the maximum religious authority. This was followed by the suppression of the monasteries and the sale of their land and possessions to nobles and members of the middle classes. As a result of these circumstances Holbein, who had returned to England for the second time in 1532 following some difficult years in Basel, was obliged to look for new clients as those who had supported him during his first period in England were dead or had fallen from favour. The body of work that the artist left in England is most notable for the portraits painted in oil or drawn on paper. Holbein also executed miniature portraits of circular format on parchment, partly painted in watercolour. In 1536 he was once again in the service of Henry VIII who appreciated his ability to reproduce faces in a lifelike manner rather than his aesthetic skills and who used him to paint portraits of possible new wives to succeed Jane Seymour, who was painted by Holbein in 1537. That portrait of Jane Seymour (Kunsthistorisches Museum, Vienna) was followed by one of Christina of Denmark, Duchess of Milan, in the National Gallery in London, and of Anne of Cleves in the Musée du Louvre in Paris. Henry VIII (Greenwich, 1491–Westminster, 1547) was a monarch of the Tudor dynasty, succeeding his father Henry VII in 1509.When his first wife Catherine of Aragon, daughter of the Catholic Kings, failed to provide him with a male heir he requested an annulment of the marriage from Clement VII but this was denied. For this reason and other equally significant ones Henry decided to break from the Catholic Church, dissolve his marriage and marrying Anne Boleyn. The Church of Rome responded by excommunicating him and Henry in turn responded with the Act of Supremacy of 1534 through which the Church of England broke away from Rome and made the monarch its head. The present portrait, previously in a private English collection, has been dated in the 1530s. 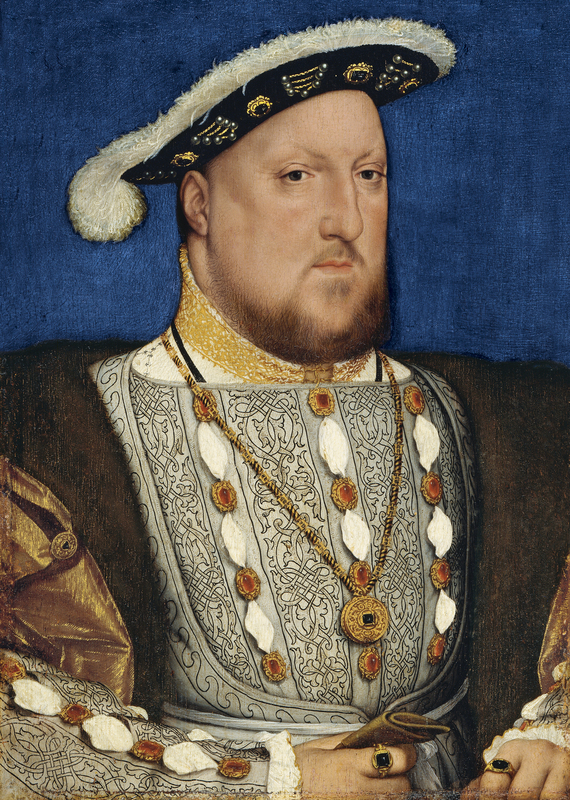 It depicts Henry in an almost frontal pose similar to one used by Holbein in various other portraits. The head, with its distant gaze, has an almost architectural solidity and strength as Pope-Hennessy noted. It has been related to a fresco painted for a private room in Whitehall Palace. The fresco was destroyed in 1698 but is known from a copy by Remigius Leemput now in the National Portrait Gallery in London. In that image the king is depicted full-length but with the same head as in the present panel, turned towards the front with the body slightly to one side. In the copy of the fresco Henry is richly dressed in similar clothes to those seen here, including the hat and the splendid pendant jewel but also wearing a fine necklace. In Leemput’s copy, which depicts the Tudor dynasty, the king is accompanied by Henry VII, Elizabeth of York and Jane Seymour. The large number of drawings that Holbein made for his clients and which he transferred by stencil to create the portraits that have survived, have led to the suggestion that the artist first drew his sitters then later in the studio transferred the image to another support. In his markedly linear images, of which this is an outstanding example, the elements that Holbein used to define the personality of the sitter are essentially the pose and the hands. In this case the frontality, sense of distance and hieratic presentation reflect the monarch’s personality and role, combining that of the head of State and Church. The painting may have been in Henry VIII’s collection but it is not mentioned in any royal inventory. It was owned by the Earl of Sutherland and later, around 1933, by his descendent, Earl Spencer. In 1934 the painting was with the Mercuria gallery in Lucerne from where it was acquired for the Rohoncz collection that year, appearing in the Collection’s catalogues from that date.